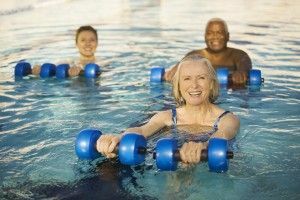 What is Hi/Lo Aqua Aerobics? Hi/Lo Aqua Aerobics is a high intensity cardio work out. It is very similar to the Aqua Power workout but there are more games and a little less rebounding (jumping). We will sometimes play ball, do ducky relay races, chariot races, or play school of fish. We still do plenty of cardio exercise to get your heart rate up. We end the class with a good stretch. All of the exercises are very self adjustable so everyone can join in. No need to know how to swim. Grab a towel and have fun with us.